Sometimes it’s the little things that count. And this time Inbox for Gmail has made snoozing messages a bit more useful for specific time-sensitive email. 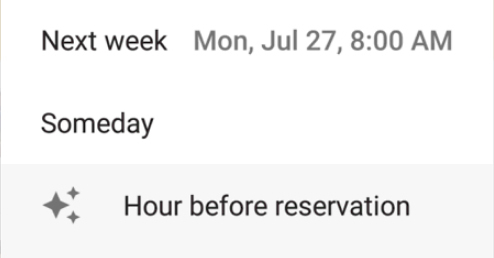 As noted in today’s Gmail blog post, when you snooze an email that has dates and times, such as package tracking or event confirmations, you get a one-tap option to snooze to exactly the right time — such as the morning your package will arrive the day of a concert. Then, the email will appear at the top of your inbox when it’s most critical for you to see it. It differs from the regular menu by adding an extra one-tap line to certain emails.